Eat. Live. Laugh. and sometimes shop! : Would you like jelly with those jeans? I admit: I did indeed sport jelly shoes in my youth. What can I say? I was born in the 70s and enjoyed all the horrid trends the 80s and 90s brought my way. Jelly shoes included. My BFF never wore jellies and swears it was a good decision. She also refuses to join Facebook. She says: "just like jelly shoes, it won't be around forever and I'll be glad I stayed away." Hmm. Well, I hate to report, but jellies are making a comeback. And I'm not talking about buying two pair for $10, I'm talking haute couture jellies. Moschino has partnered with Kartell, the company known for producing Phillippe Starck’s iconic Louis Ghost chair, to create this “top quality” interwoven plastic. If that didn't convince you, look at the array of colors. Oh, my! They’re 100% recyclable and will be available in winter for approximately $100. 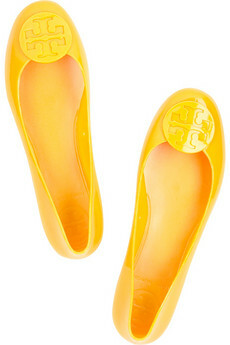 Alternatively, Tory Burch has entered the fray, or rather jelly too. A few sizes and colors currently on sale for $67 at Tory Burch.com. They are plentiful on ebay for less than $70. Bargain. Especially knowing this trend will undoubtedly come 'round yet again!